I am now more determined than ever to call for – in a calm and clear way – a complete change to the way decisions are made about bushfire protection in the Grampians and surrounds. The Picaninny fire, instead of being confined to the lower reaches of the mountain, as stated, shot up the entire north side of the mountain to within 100 metres of its peak and another section then spread around the base of the southern side – our side. It was so hot that we could feel it standing in our garden 700metres away! 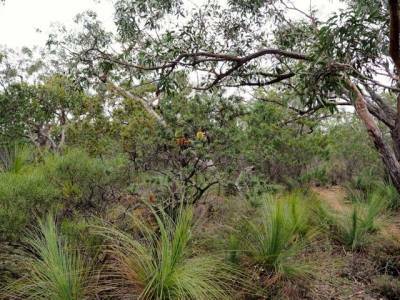 The only accessible Casuarina (she-oak) forest in the Southern Grampians was destroyed in the blaze. Just half a dozen trees remain. A beautiful copse of native pine trees was also destroyed. It will take 30 years for these trees to regrow. And much of the rest of the northern side of the mountain’s bush is a charred wreck. As it stands, 87% of the Grampians has been burned by bushfires and fuel reduction burns since 2006. 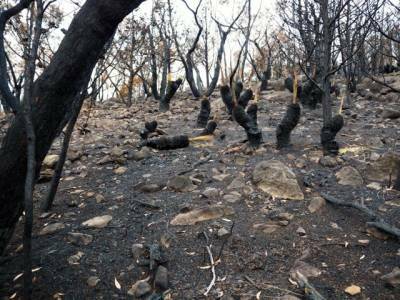 A huge swathe of the Grampians National Park was devastated again by fire last summer (this year), and most of the northern part of the park is closed to walking as a result. 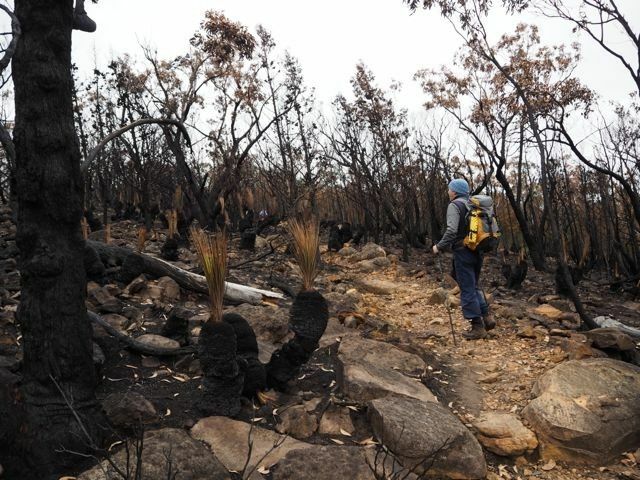 Only two walking tracks in the entire Grampians remained undamaged by fire – The Picaninny Mountain was one. Now that is gone. The real threat to Dunkeld comes from the fields of grass that surround the town. 2. 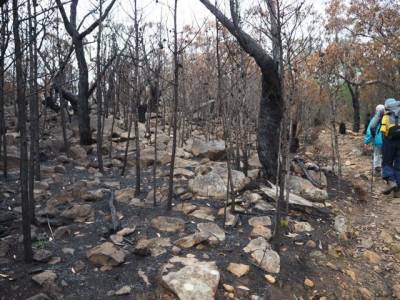 Fire engineer, Harry Wakeling, from Aquila Eco Lodges Dunkeld says burning the bush on The Piccaninny Mountain (or anywhere in the Grampians) will have minimal impact on protecting Dunkeld. He advises us to plough fire break circles around the township of Dunkeld so the fire trucks can access the grasslands and respond quickly to grassfires that can come from any direction. 3. 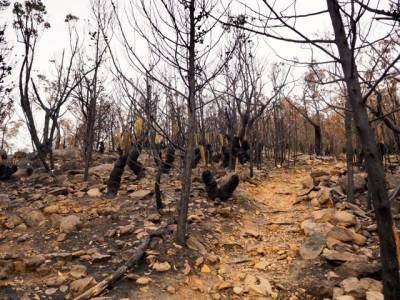 Tourism in the Grampians has been nearly destroyed by a number of natural disasters and damage from uncontrolled burns since 2006. 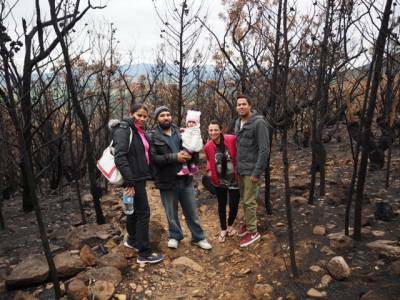 The devastation wrought by fire is seared into the memory of local and international tourists, and it takes those of us in the tourism sector years to restore interest in our fabulous region. The aim of this burn – according to the letter I received – was to reduce the chance of ember attack on Dunkeld by reducing undergrowth in the bush and taking some of the stringybark off the trees. The decision-makers are in Horsham – about 137km from Dunkeld – specifically the Department of Environment and Primary Industries land and fire manager for the Wimmera district, Russell Manning. But Manning and the Minister for Environment and Climate Change, Ryan Smith, claim in letters to me that the current strategies have Dunkeld community support. He has the support of the Grampians Asset Protection Group, a group of largely Country Fire Authority members and broad acre farmers who cannot possibly claim to represent our community. Because their meetings are closed to the community. Previously after corresponding with GAPG I received a suggestion, albeit indirectly via a letter to the local newspaper, that they knew who’s properties Country Fire Authority would not defend indicating the properties of those townspeople who disagreed with their strategies! In this part of the world, that kind of comment is pretty scary. It takes patience and sustained energy to grow a beautiful garden, to develop a yoga practice, and to prepare a beautiful meal. It takes patience to instigate change. I feel strongly about this issue, but my focus is a community one. I want my voice heard, yes, but I also want other people in in Dunkeld and surrounds, including the GAPG and the CFA, to be heard as well. I’m calling for a process in which we all have an opportunity to both listen and speak; a process that galvanises the community and not one that fractures and fragments it. I’m willing to listen, if I also have the chance to have my say, and I think there are many other people in the community who feel the same. Fire doesn’t just threaten lives and assets – it can destroy our economy. I know there are many interests involved, and that the subject is an emotional one for many of us including, I suspect, the members of the GAPG and the CFA. That’s why I think we need some help in sorting out the issues. A series of community consultation meetings. A professional facilitator to manage these meetings, to keep them focused and ensure everyone has a say. A community-wide survey of views and opinions on bushfire management for those who cannot attend community meetings. Transparent and open-decision making in future. Reviews when things go wrong, such as the burn on Picaninny Mountain. Writing my views in this post has been really therapeutic for me. Just by reading it, you have helped me enormously. Email me and let me know I have your support (). I’ll tally up the total number of responses and tell the Minister how many Griffins Hill guests support better consultation. Well argued piece jane. There is a huge gap between what we are being told by "the authorities" and the truth on the ground. It is clear that these back burns will neither protect community and assets nor be of ecological benefit (check out the Friends of Hoddles Creek website for our research into these issues: http://www.provender.com.au/fohc/). It is imperative that the community challenges the political drivers and reductionist science which are behind the 'fuel reduction" policy of the state government. With the loss funding to good science institutions we need to resort to 'citizen science' - where we educate ourselves and become 'the experts'. As a first time visitor to the Grampians, overwhelmed by its natural beauty, I was shocked to hear that the recent fire on Mt Piccanniny had been deliberately lit as part of a fire protection strategy. Living in Sydney, I have witnessed the aftermath of many NSW bushfires over many decades. This prior experience gave me reason to interpret the damage witnessed on Mt Piccanniny as caused by a fire lit either accidentally or intentionally. The nature of the destruction of the bush was nothing like any planned controlled backburning I've ever witnessed in national parks. It is obvious that precious flora has been killed, leaving extensive parts of the mountainside barren. I can only imagine the effect on the fauna in the area. 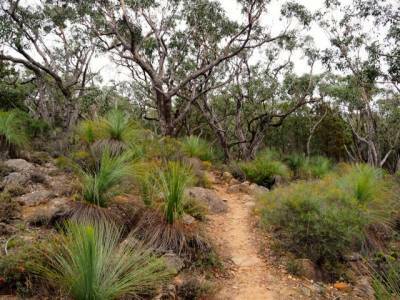 While attending a yoga retreat at Griffins Hill, 4 of us walked the trail up to the top of Mt Piccanniny, and were all saddened to see the extent of the destruction of the bush along a significant proportion of this world-class track. On return to our lodge, we were all in disbelief to hear that this fire was no accident. I see it as pure vandalism. One can only hope that something has been learned from this event so that such unnecessary devastation is never repeated in any national park in our beautiful country. You have my support Jane. Very well argued piece. Thankyou for taking the time to articulate your thoughts. I think the strategy forward you have outlined would assist a diverse range of voices to be heard and a better fire plan response be drafted rather than a reactive one that has resulted in such a devastating impact on such a treasured park. The Picanniny walk was the only walk we as a family have climbed many times due to it's location, beauty and ability of our 5yr old to conquer without a piggy back!